Whilst updating my prints shop I came across an old painting I hadn’t uploaded. A bit different from my usual stuff, but I learned a lot from painting it. Original available to buy, please email anna@annagreaves.com for more information. Lovely! It almost looks like watercolor. super well done and shaded, I love the different variations of red and pink! Wow! I hadn't seen this one yet. Very nice, lady! Thanks sweets, it's really old. But worth showing I think. Very cool. And very different for you. I like it. 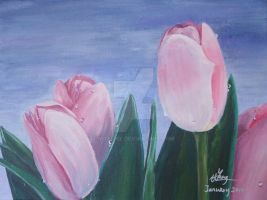 well, i have to say... every since i tried and failed and tried and failed and tried and failed to paint a rose, i have avoided the subject at all costs for years.... and honestly i am going to continue to avoid roses... you on the other hand should think about painting more of them. Thank you They didn't come out as delicate as real rose petals, but the fleshiness of them was a deliberate mistake. There’s more meaning to this piece than most people see... at least to me there is. i know exactly what you are saying... i am not surprised that this is more than a double portrait of some roses... fleshiness indeed.